The S8 white microfiber interchangeable slide sole is the standard slide for performance shoes and is recommended for normal to tacky approaches for the stroker who needs a longer slide. Profile: For the "stroker" who needs a longer slide. Perfect for all conditions and any bowling lanes you go to. Hello Brian. Yes, this can be for left or right handed soles. does this go on inside of shoe? Hi John. This is a replacement sole for Dexter bowling shoes that goes on the bottom of the shoe. Will it fit any make of bowling shoe? Hello. These are meant to fit any Dexter SST model shoes. Yes, it will fit any SST shoe. Will this fit the SST 4 Dexter Shoe? Yes, this will fit any SST model shoe. does it perfectly fit for Dexter Mens SST 6 LZ Right Hand Wide Width size 9 ? or should i have to cut it after putting it on? These will be able to fit the SST 6, you will just have to cut to fit them. These will fit any Dexter shoes. Unfortunately, the Ricky IV's do not have interchangeable slide soles. The Ricky IV shoes have a fixed sole that cannot be removed. Would this fit the dexter keegan plus? How is it applied to the shoe? If your shoes are interchangeable, then there should be velcro on the bottom of your shoes. This sole will be applied by using the velcro. This will be a medium slide. The higher the number on the slide for Dexter soles, means the more slide you will get. do they no longer make the s6 sole and heel set? 4/22/2019 - By tim c.
Unfortunately, Dexter does not make any kind of sets anymore. 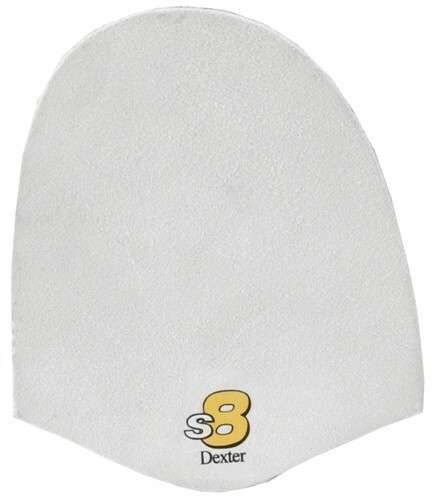 Due to the time it takes to produce the Dexter SST White Microfiber Slide Sole (S8) ball it will ship in immediately. We cannot ship this ball outside the United States.